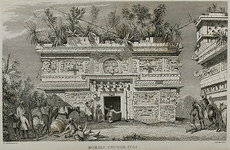 The Robert Goldwater Library is a noncirculating research library dedicated to the documentation of the visual arts of sub-Saharan Africa, the Pacific Islands, and Native and Precolumbian America. Part of the Museum’s Department of the Arts of Africa, Oceania, and the Americas, the library is open to adult researchers, including college and graduate students. The Library collection comprises over 20,000 books published worldwide, with an additional 10,000 volumes of periodicals, including current subscriptions to 200 journals. Subject strengths include the art and material culture of West Africa, Papua New Guinea and Irian Jaya (Indonesia), and Precolumbian Mexico and Peru, with extensive holdings in related disciplines such as anthropology, ethnology, and archaeology. The library routinely collects exhibition and auction sales catalogs, as well as academic theses and dissertations. Watsonline, the Museum’s online library catalog, provides access to the Goldwater Library’s holdings, with searching available by author, title, subject, keyword, or call number. 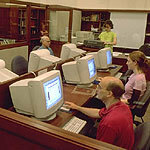 An in-house card catalog provides access to articles in journals held by the library. A reference librarian is available during public hours to assist the visiting researcher. Library staff will also answer ready reference and bibliographic questions by telephone, fax, or email. Located on the mezzanine level of the Michael C. Rockefeller Wing, the library is open Tuesday through Friday, from 10:00 a.m. to 4:30 p.m. It is closed Mondays, weekends, and staff holidays. No appointment is necessary except for the period from August 1 through Labor Day. To visit the library, a pass must be obtained from the Reception Desk in either the Great Hall (82nd Street, main entrance) or the Uris Center (81st Street, ground floor), where directions to the library will be given. Museum visitors intending only to use the library do not pay Museum admission. All materials other than those in the Reading Room reference collection must be requested through the Circulation Desk by using call slips. Researchers can request items (up to five items at a time) until 4:15pm daily. The stacks are open only to designated staff. Coats and nonessential packages must be checked at a Museum checkroom located on the main and ground floors before entering the library. Researchers must sign upon arrival. Food and drink of any kind are forbidden, as is smoking (which is prohibited throughout the Museum). No form of photography is permitted. Researchers may use laptop computers. A photocopier located in the Reference Room is available to researchers for a small fee per copy. The library cannot assume responsibility for any possible infringement of copyright laws in the copying of materials in the collection. The library of the Museum of Primitive Art, located on West 54th Street in Manhattan, opened to the public in 1957. After closing in 1975, it was transferred, with other holdings of that institution, to The Metropolitan Museum of Art in 1978. In January 1982 the library reopened to the public as the Robert Goldwater Library. Goldwater (1907-1973) was the first director of the Museum of Primitive Art and a renowned scholar in both modern and African art. His Primitivism in Modern Art, initially published in 1938, was the pioneering study of the subject.